The Miller Place School District recently celebrated the philanthropic efforts of 22 students from North Country Middle School who recently participated in the Town of Brookhaven’s seventh Annual Polar Plunge competition to raise money in support of the Special Olympics. 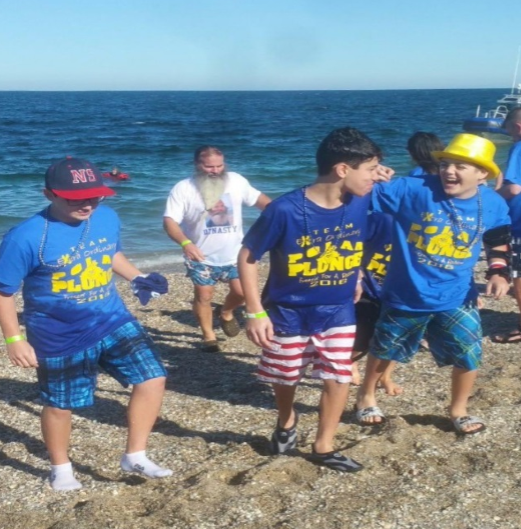 The event gives Brookhaven residents an opportunity to have the exhilarating experience of swimming in the chilly waters of the Long Island Sound, while competing for the team that can raise the most money for athletes of the Special Olympics New York. The North Country Middle School students, “Team Extraordinary,” raised more than $10,000. The team was started by North Country Middle School seventh grader Robert Fitton in 2014, after his brother was born with Down Syndrome. Robert personally raised more than $2,000, which was the fourth largest at the event.